One of the most memorable elements of The Hunger Games as a film series for the fans is, of course, the music, which is a great opportunity provided by the notion of a cinematic adaptation. The music played a key role in bringing the story of the four books to life, and in the end it's safe to say it really became something incredibly closely associated with the stories, just as much as the characters themselves, story moments, and of course, the book quotes. N.B. This interview has been lightly edited for clarity. QQ: You’ve worked on a number of major franchise films - obviously The Hunger Games, you did the first two Dark Knight films with Hans Zimmer, and now you’ve got Fantastic Beasts coming out later this week. As the films go on, as there are sequels, and you do the sequels for those; and as the expectations kind of build up from the fans, from the filmmakers and the other people involved - how do you deal with that sort of pressure, if there is that sort of pressure that you feel? JNH: Well, you know…the one thing that I never do is think about the results. I’m just so involved with the day-to-day writing and the picture changes, the rewrites… So I’m thinking when I’m working on a franchise movie, or a mega blockbuster, I’m just thinking of trying to write the right music for one scene at a time. And I think it’s just like anything else in life - you just have to take it a little bit at a time and how it turns out, whether it’s a huge success afterward, that’s really not in my control. If it’s a huge hit that’s wonderful, but it’s really so beyond my control, I don’t find it to be much pressure at all. QQ: So following on from that, with Fantastic Beasts, you’re following in the footsteps of John Williams, Alexandre Desplat on the previous films - did you feel with this, especially as it’s a prequel to the main [Harry] Potter series, did you feel like you had to somehow top them at all, or did you just think about making your own thing? JNH: Well mostly I was thinking about making my own thing, because I think, you know, while it’s a prequel to Harry Potter, it’s a very different movie. It has its own cast of characters, and it’s a very different story, and it’s 70 years before Potter comes into its existence. So I think it was important that the movie stands on its own two feet and that the music is able to stand on its own two feet. I did pay homage, which I think is the right thing to do in terms of storytelling, to John Williams’s incredible Hedwig’s Theme, but just very very slightly, for just a couple of seconds at the very beginning over the Warner Bros. logo, maybe for a total for 20 seconds in two other spots in the movie. But primarily these are all new themes for all new characters. QQ: Going to Hunger Games, you’ve worked with two directors on this - Gary Ross and Francis Lawrence - how different were their approaches when working with you on creating the scores for the films? JNH: I knew Gary...I never worked with him as a composer, I had known him from a movie I’ve done years ago for Ivan Reitman, a movie called Dave, that Gary had written, and he was very involved in the post-production, and he and I got to known each other and we became friends. So, when I did The Hunger Games with him, it was kind of a short time, we had very short time doing it, because I turned down the movie earlier in the year because I’ve never heard of The Hunger Games. And my son said, “oh, dad you’re crazy, this is gonna be so good…”, so they hired someone else and then I guess it didn’t work out so they came back to me in November [Note: Danny Elfman was originally hired to compose THG, before dropping out due to what was revealed by music producer T-Bone Burnett as creative differences with director Gary Ross], and then it had to be recorded…two days before New Year’s Eve, we had about 6 weeks to do it. And it was a very different movie, you know, the first Hunger Games was kind of Appalachian in feel, kind of much more rural, it was a smaller world anyway. So I felt the music had to be kind of smaller, a smaller ensemble, not a big orchestral score. As soon as Francis came along, he and I had done I Am Legend and Water for Elephants together, we had quite a good relationship already, as composers-directors go; and it was a much bigger film. Catching Fire was more of an epic film, where you had a bigger picture of all the combatants and many more characters were more fully developed, so I felt it was more appropriate to have more of an orchestral epic score. QQ: And when you listen back to the score albums and the films, it’s kind of that difference that you’ve stuck through with the three films you did with Francis, with Catching Fire and the two Mockingjays. JNH: Well, two of the most important themes I’ll say, [one is] is kind of what I always thought of as the ‘love theme’, and then when Katniss turns around and gives the sign in the forest [the three-finger salute]…and then an epic sort of theme comes in - those were established in the very first movie. And then we had an opportunity to really exploit those themes in a bigger way, and add some more themes in the next movies. It’s great to be able to do a franchise like that, because you establish the tone and the themes in the [first] movie, and then you have them at your disposal when you’re writing the next one. QQ: Out of the four Hunger Games films, and it’s probably a tough question, which score moment - which cue from all four films that you’ve done is your favourite, or which one were you the proudest of? QQ: One thing a lot of people have been asking about is obviously The Hanging Tree from Mockingjay 1, what was the process like on that, because you worked together with The Lumineers on this, is that correct? JNH: Well, I didn’t work with anybody on this, I just took what I got - when I heard it the first time it was just Katniss sitting there singing it all by herself, there was never anything other than her voice. And Francis asked me “can you just take that and can you write some music to it so that it builds and builds and it becomes kind of an anthem at the end”. So, I just did my job, and I just wrote new chords, added orchestration, and just did what I do, and then somehow it just somehow became this huge hit, which is just a complete accident. QQ: Exactly, and that’s what the shocking thing really is about it, how it became so popular - how it got onto the Billboard 100, hot it got onto all the big download charts…especially also the studio in response to that success ended up bringing out two or three official remixes for radio. So how do you feel about the response from the fans and the studio and everyone else to this piece? Because, I mean, it must be daunting! JNH: I was shocked! I thought it was kind of funny, just amazing, because people would say “oh you’ve got a hit record!” And I’d go “really? What is it?” And they’d say “no, it’s The Hanging Tree”…I was so unaware of it. But I felt that…it was a testimony to Jennifer’s popularity, you know, this is an opportunity for all the fans to sort of take a piece of Jennifer home with them, and I understand that. I wasn’t surprised, quite honestly…in one way I wasn't surprised because Jennifer was so popular, the character [of Katniss] was so popular. But the fact that my name was associated with it…I always felt quite embarrassed by it, quite honestly. It should’ve just been called ‘The Hanging Tree by Jennifer Lawrence with James Newton Howard’ or something. QQ: And not the other way round! 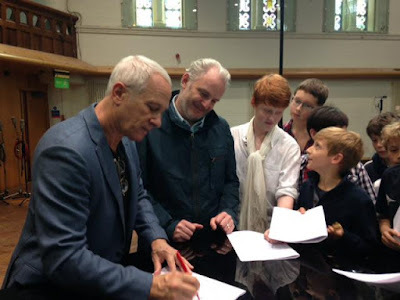 JNH: Yeah, it was slightly embarrassing, but we straightened it out in the end and I think it eventually said ‘James Newton Howard featuring Jennifer Lawrence’, which was the way it should’ve been right from the very beginning. 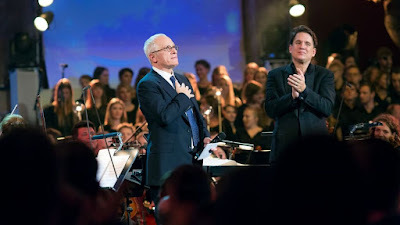 Stay tuned for the second half of our interview with James Newton Howard, including more on his Hunger Games work, as well as some exciting tidbits on his new projects coming up, later in the week. 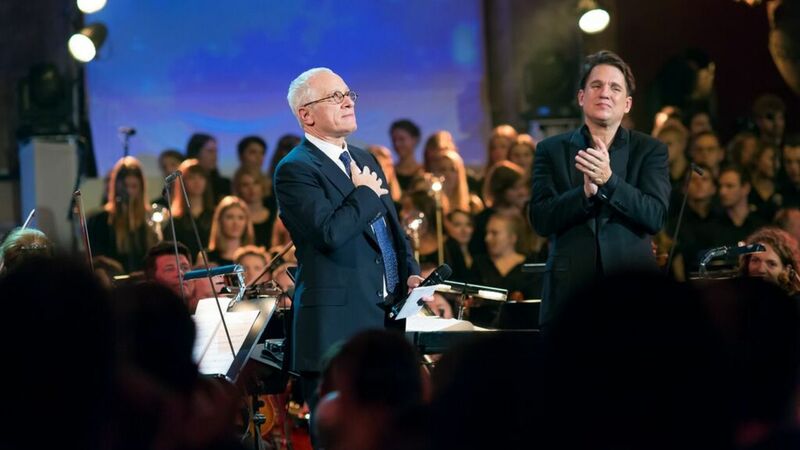 James Newton Howard: 3 Decades of Music for Hollywood takes place at the Royal Albert Hall in London on November 3, 2017, and tickets are available now from the RAH website. Following the London show, the concert will visit more European cities - for more information, check our our post from earlier this year. Big thank you to the team at the Royal Albert Hall for setting this up!